To travel even more comfortably, Thello offers a new comfort level on its Paris-Venice night trains. 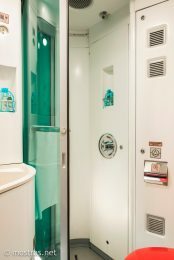 With the Premium cabin, enjoy the comfort of the sleeper cabin – a bed furnished with cotton sheets, a travel kit, a welcome drink as well as a complimentary breakfast – with a bathroom all yours (including shower and WC) directly in the cabin. This comfort is only available for passengers booking an entire cabin.